Google Penguin 4.0 is finally here. Let's talk about it! Google Penguin 4.0 is finally here. Let’s talk about it! 1 Comment on Google Penguin 4.0 is finally here. Let’s talk about it! Finally, the Google Penguin 4.0 has arrived. On September 23, Google made an official announcement that Penguin is now part of Google’s core ranking algorithm. And if this was not enough they also stated that now the algorithm is real-time so any changes will be made as soon as the affected page has been re-crawled and re-indexed. But what does this mean for website owners and businesses? I’ve decided to find out by discussing the topic with Zara Altair, Michael Stricker and Bill Hartzer. Zara Altair is a Professional Ghostwriter and one of the best Semantic Writing and Marketing professionals out there. Writer and educator Zara Altair work with website developers and business owners to create semantically oriented text. Former U.S. Marketing Director for SEMrush (the leading research tool for Competitive Intelligence), Michael Stricker is well known for merging exhaustive research and statistical analysis with clear communications. Michael has spoken at conferences like BrightonSEO, Pubcon, ClickZ Live, Etail, HERO Conference and SMX East, and contributes to various blogs such as CIO.com, B2Community, and SEMrush.com. Bill Hartzer is a successful website and search engine marketing expert. He’s been practicing search engine optimization and website marketing since 1996. Senior VP Agency Services at Advice Interactive. SEO & Domain Name (New gTLD) Expert. Bill Hartzer is a master of combining writing and online skills in order to create compelling and useful websites for businesses across the world. Omi: Hello everybody and welcome to the Omi Show again. I’ll call it the Omi show from now on. Today I am joined by those three amazing and very knowledgeable digital marketers. I will start with Zara Altair – a Semantic Search writer. Michael Striker – in short, one of the best SEO and Digital Marketing speakers in the whole wide world. Omi: And I mean, I don’t really know where to start with Michael Striker as he’s so famous. And the last but not the least is Bill Hartzer who is a very successful Website in Search Engine Marketing Expert. He’s been practicing SEO since 1996. Yeah, you heard me right – 1996. I was very, very young. I’m not going to do a full introduction of those three American dudes because they are way more famous and well known than me. You can just Google them if you don’t mind me, guys. Omi: So today we are gathered to talk about the latest Google Algorithm update. 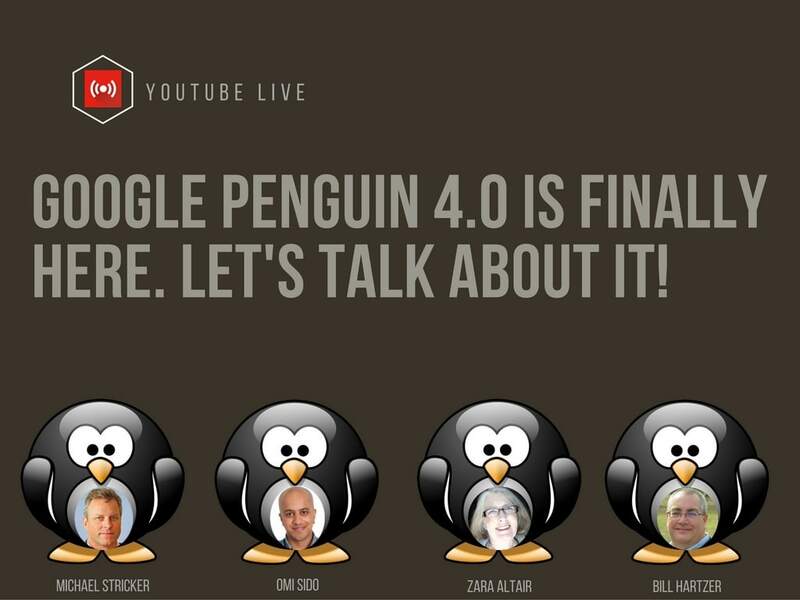 So on September 22nd Google released their latest Penguin update called “Penguin 4.0”. We all know what the Penguin update is. Bill, can you turn off your microphone, please. Michael: I’m going to mute myself for now. Omi: Okay, perfect. Let’s start with Michael. Michael, like many SOEs, for example, I’m an SEO but I’ve never ever seen a Penguin penalty. I know what Penguin is but I’ve never experienced it. Can you give us a brief history of what the Google Penguin algorithm is, please. Michael: It’s hard to believe that there are SEOs around who haven’t been through Google Penguin but it has been two years since their last update between Penguin 3.1 and 4.0 so, a lot of time has elapsed. Google Penguin can be thought as their Link Quality update. It has since evolved into part of the core algorithm search running all of the time and when it’s first was released by Google, the intention was that they were going to do what they could do to eliminate web spam and if you had a small website and you sold a particular item and you wanted it to be at the top of the SERPs, you could build a million links all across the web from other countries and from irrelevant websites and using sidebar links and footer links and widgets and all kinds of techniques that were engineered to deliver PageRank. They weren’t engineered to deliver valuable traffic, they weren’t engineered to deliver relevance, they were just meant to make that targeting website rank better. And so Google realizing that there was actually a lot of push back in the search community among users dissatisfied with the results said we have to do something about it and thus Penguin was born. So, as you can imagine when they first released it, there was a lot of reliance on the tools. Like so you would use Ahrefs.com so you would use Majestic database of links and you could turn wherever you could Google Search Console or wherever you could to pull down the links to look at and try and figure out what among this Google might be looking at spams? What do they think was so bad that you lost traffic? Well, there were other things going on at the time as well, so people sometimes confuse Panda -which is largely content related – with Penguin. So you can’t confuse the two and you have to have a sense of what constitutes a low-quality link. This is what raised the conversation from quantity of links to quality of links and so you really had to think about that so. Like so you would use Ahrefs.com so you would use Majestic database of links and you could turn wherever you could Google Search Console or wherever you could to pull down the links to look at and try and figure out what among this Google might be looking at spams? What do they think was so bad that you lost traffic? Well, there were other things going on at the time as well, so people sometimes confuse Panda -which is largely content related – with Penguin. So you can’t confuse the two and you have to have a sense of what constitutes a low-quality link. This is what raised the conversation from quantity of links to quality of links and so you really had to think about that so. Omi: But let’s just make something very, very clear. Are links still important? Because since Google released the first basically Penguin 1.0, people started questioning: Are links important? Shall we link to other websites? Shall we allow other websites to link to us? This is a valid question? It’s freaking out a lot of small businesses. Michael: During a recent hangout that Google does their webmaster hangouts and if you don’t have the time to put into sitting through them, people get to post their questions to Muller and Ilias and you know all these guys from Google and sometimes you get a pretty good, pretty clear answers. So Anton Shulke on his webinar series that you know very well, he had a gentleman, the Googler, he’s actually based in Ireland whose name escapes me now. But what he said during it was the clearest indication that I have heard in ages about what really is important to the algorithm. And he basically said that it is content, links, and RankBrain in no particular order, right? So we know that links are among the top two signals out there. And still to this day so you know, here we are at the end of the time period where for the last 2/3 years everybody talks about content, content marketing all the time. Inbound marketing and links while everybody has been thoroughly beaten by Penguin. Anybody who really knew what was going on was struggling to detoxify their links and all of that. Here now at the conclusion of all this talk about content, I think that links may be and maybe Bill Hartzer has an insights on this I think that links have become an almost neglected tool in what people use to rank their websites better in Google. Omi: Bill, do you want to add anything to this one about links? Bill: Yea, you know it turns out that Google has as I believe it was Gerry for Google who just within the past week or two, they did say that it is still extremely difficult to rank well in Google without links. So, that is a primary factor. I mean it really is. Other than content, it is really still possible. It’s extremely difficult to rank without links. You have to have links from other websites, you know as far as the organic algorithm. Even in Google News and so forth, you got to have the links and when we are talking about the links, not just necessarily static links but from websites and blogs and trusted sites but we do need those social links as well. I mean every social tweet is considered a link. Omi: So my clients and friends will normally ask me if you will have to rank them, which one will be more important. Content or links? Because as an SEO manager I have seen a lot of websites ranking just on links, backlinks and with let’s not call it bad content but a content that it’s not that good. Do you think that links are in a way a little bit more important than content? The same question to Michael and Zara. Michael: But I think you are going into a kind of controversial territory in a way that you know you are comparing content with links and you might say you need both but when we think of this content nowadays seems to be some words extensive of maybe a thousand words (you know) text matter and some cases images but mainly things that can be easily crawled indexed understood by Google ripped apart and known for semantic core and all the rest of it and content is so much more than that. So once Google has a sense like, let’s say we are talking about an e-commerce site and their content is very thin and sparse and if it was ranking on that alone, it will rank very poorly. Yet they have the right product names and brand names of products on their site that Google very clearly understands and has done a great job of indexing and Google is very happy to send traffic there because now, Google is probably,(people argue about this) people supplying user experience signals to the traffic, so they have great content but I have great products, people arrive on my site from search, they don’t bounce away, they don’t bounce back to search pull those sticking as Rand Fishkin likes to call it and stick around and the pages are clear, they are actionable and have some form of conversion right there that people use and Google is very happy to send traffic there. So, what’s more important, it has to be, I mean you can fall on either side. I say it has to be both but I think you need a very different understanding of what content is than what the way most people frame it in their minds. Zara: Now, I totally agree with that because where content and user experience. I just work with a business owner and we pretty much together redesigned how the website would work according to his customer segments. He has several customer segments and then each of those segments they were segments. And links are really important. It’s all that stuff about (you know) content, content, when you talk about RankBrain and RanBrain, is learning all those associations within the text of the content. So if you are writing clearly, it doesn’t matter if it’s short or long. Google is understanding and the more it understands, the more it understands. Which I think is really exciting on that. Omi and I talked about RankBrain, when was that? Way back. Omi said ‘You don’t have to do anything, just keep doing everything that you have been doing that’s good’ and I have to agree with that but with links within content, I don’t think it’s either one, I think it’s both. You know when you are creating content, you want to have links that are appropriate to what you are saying and have those links relate to what you are saying in each piece. And that the best way to do that is for each piece of content, there is one focus theme. Zara: And then those links are going to be supporting that theme, whatever it is that you are saying. So I don’t think it’s an either or-or situation because you are looking at those three Google ranking factors. Omi: Before going into the next question, I just wanted to make a small announcement. Since I announced this Hangout on LinkedIn, my LinkedIn is full of so many questions. Looking at the list here more than fifty. So probably we are not going to be able to answer all of them in the 1hr we’ve got but I’m sure that if you contact me directly or Michael or Bill or Zara, they will be more than happy to answer your questions directly or in person. So, let’s go to the main thing, Michael. Tell us a little bit about this update that happened on 22nd September. Michael: So, the long awaited release of Penguin 4.0 that Gerry Muller and Ilias Tacker and other people had grown tired of responding to questions about when is going to come and when is it not going to come and they kept saying before the end of the year and any day now and it finally arrived. So look quiet at first. First things that happened had to do with watching Penguin work on the latest update as if Google had crawled the information and was applying it in the old fashioned of applying an update and so actually, probably in the first couple of weeks, about the first week, there is probably more negative effect and things falling in the rankings of web pages falling, not the entire domains but batches of web pages that had particularly bad links. Now Google is a zero sum game so, of course, if you are driving things down in ranking, other things are rising, ok! Maybe not as radically, though, maybe everything kind of shifts up by like a position or two and that’s it. But around the second weeks (2nd week of October) was when Google announced this after people noticed the effect and spoke about it. The positive effect started to occur and you see people like Glenn Gabe and Jennifer Slegg and people talking about and even showing images from whether it’s from SEMrush where from people’s Google analytics account that showed the resurgence in organic traffic from Google. Now Google is a zero sum game so, of course, if you are driving things down in ranking, other things are rising, ok! Maybe not as radically, though, maybe everything kind of shifts up by like a position or two and that’s it. But around the second weeks (2nd week of October) was when Google announced this after people noticed the effect and spoke about it. The positive effect started to occur and you see people like Glenn Gabe and Jenifer Slag and people talking about and even showing images from whether it’s from SEMrush where from people’s Google analytics account that showed the resurgence in organic traffic from Google. A stepwise and I’m looking at one here, in particular, starting about the 21st of October and by about the 25th, much of the recovery had occurred and in this case I was almost at 20% or 15-20% increase in the total number of keywords for which this particular website was ranking again and have been dropped out. So there are a lot of things that play into this and the original Penguin strike, you might have experienced any number of positions lost for a particular keyword and you could drop back to the second page, you could have dropped completely out of the top one hundred. So that’s it, to see these recoveries, to hear about them and make some casual increase from people that thank grace, I used to work with, we do lots of link profiling and a lots of recoveries and through a soul, every one of them says that their facts have been positive so that’s good to hear. Omi: So, are you saying something like Google has to literally re-crawl the whole Internet so and only then we are going to see the positive or negative changes. Michael: So yes, what I am saying is that disavow file that a lot of people created to recover from Penguin where you put the domains of all the sort of bad link sources that you had, your browsing directory, the ‘free for all links’ and the link schemes and all of that . The disavow files that you filed -and you may have done this up to two years ago or even further back – Google then had to go and check through them and crawl those domains and in some cases those precise URLs you may have entered in there in order to figure out. Did those link sources still exist? They could have completely been taken down, abandoned, there is all kinds of things that could have happened and so that had to be verified and then in addition to that, there is this whole thing about incorporating Penguin into the core algorithm. There is another question from somebody else on LinkedIn where they were asking me “In a way if we say that the new algorithm is part of the core algorithm now, are we talking about an update or a completely new algorithm? I am just trying to combine two questions into one. Michael: So you know, if I can just answer that then somebody else can jump in at it really is that in the past and this is why people had to wait two years, it was the update and the idea of an update is they have a specific crawl and then an action that they take on the database result that was Penguin; that’s when result occurred, they usually occurred in a compressed time frame after this specific crawl. Now, every time Google does its crawl and crawls your particular site, especially the sites that are linking to you, right? Now it’s going to take effect much more rapidly. If you are a big site and got lots of fresh content and Google is on your site crawling it several times a day, they could act that rapidly. If your site that’s a blog, maybe you get out a post every week or two and you only crawled like once a week well, that’s the frequency with which Penguin or any other of the core algorithms will act. Omi: Ok I get it. So, Bill “How should we understand the ‘real time update’? Why are we talking about first real time update and then part of the core algorithm at the same time? Omi: Can you further explain what you mean by manually because I can’t really imagine them going to say a website like David Mail and checking every single link? Bill: No, it’s essentially they have a separate filters and separate crawlers that are crawling all the links and they put them all in the database and figure out everything and then really just combine the two (Penguin with the current set of search results) which basically would as originally have whereas you would rank well with the core search results but then it applies this filters that say “Ok”, if this site has bad links then essentially, you were ranking well before and they then can or you’ll be kind of just be dropped out. What I am seeing now is that there are still, you’ve been since this real time which basically means that as they crawl the webinars, they discover a way to your website and as they cash the page in Google cash, that’s the time when they have the ability to apply that link, whether the good or bad link toward to your site. So from before, when they say manually; there is not any combining of the database basically, everything now happens essentially as they crawl the web and they evaluate ranks. Zara: So I think the positive results of the changes that in the old ways that Penguin happened, if they were bad links on the site, that site was penalized. But now, it’s page by page so if you can have a page that Google says “Oops! Bad Link” but that doesn’t affect the entire site. It’s page by page now, so I think that a good sign for people and that as they check their links and fix those links, those pages can come back but the whole site isn’t penalized. So I think it’s like breathing room for a lot of people who have experienced that in the past and that the results are more or less instant whereas before you have to wait and wait and wait and wait for the next Penguin to come around. So it is especially beneficial for small businesses when this is their website and it was penalized and then it was a long, long time between the times they actually fix the problem and when they got back Google’s good graces as it were. So I think that’s a real benefit as that real time component is that the entire site is not penalized anymore.It’s page by page. Bill: Yes, what I am actually seeing is that previously is an entire website was penalized. And so I’ve got clients who literally before real time Penguin, no matter what we did, it just didn’t matter to the site and fix the links and disavow and completely remove links, they still had this penalty. When real time kicked in, what I am seeing is there are still this core or a lot of core sites that whereas they are a lot of the links that they had built were very specific anchor text and their money keyword and their best and more supporting keyword in anchor text linking to the home page and so what I am seeing is still there are a lot of sites out there and I talk to site owners that say ‘ok, well actually their entire pages are a lot of those rankings and long term/tail phrases have come back in the search results because they don’t have as many anchor text links, they have links to enter your pages but they don’t have as many or they were not as aggressive before with linking but one of the bad links will point you to their home page. So in fact, what’s happening is that sites have come back with the fair amount of traffic but still, we are not seen with real time Penguin, the sites home page in particular coming back and so when I am talking it to analyzing some sites with new clients that are come out in the past week or so. I have looked at sites and seeing they still have a lot of anchor text optimize anchor text from world quality sites and their home pages don’t come back but all the interior pages. So there has been a bump in traffic but not where we really want it to be and that really is a clue to the effect that you just talked about Zara, about the fact that it’s page by page. Michael: Yea and it’s definitely a granularity to it and that’s great and it was another feature out that came out while Googler and I thinks it was Muller was talking about this in a Hangout that it’s really a demotion of the site or page to which the link points. It goes back to the origin, it goes back to the link source and so if that link source or method of linking is overly engineered, if its exact match anchor text like Bill was talking about, if it’s overly engineered linking with just playing old bad irrelevant linking then, it will no longer deliver value and this something I think a lot of SEOs and merchants struggle with all of the time. It’s not that it’s a penalty any longer, right? But being told that Penguin is really about just demolishing the value from the link so it no longer helps. A bad link is not going to help, a good link will help. So part of my take away from this which I find very heartening but could be ruined overnight by venture of foolish SEOs is that you can build as many links as you want and as long as you don’t get way beyond the balance point where you’ve got really bad links then they are the majority of your links then you are fine. You have the balance and you have some real relevant high authority useful links and you are bringing a lot of quality traffic but you could still be doing some not so best practice not so great link building. Just to swell the volume of links and ok so the threat there is no longer that your pages will sink, that your website will drop in rankings. The threat now is you are simply going to spend money on the effort that’s not going to deliver value anymore. Omi: Guys, I just want you to…because you’ve already mentioned it and because one of the questions actually so the new update works basically on page level and there are some funny questions here so, a guy is asking me “Can I actually if the new algorithm update is working on a page level, Can I actually experiment with parts of my website and (I know it’s funny) if it’s not gonna sink the whole website, can I do an experiment on just one part of the website? What do you think Michael? It’s a valid question. Michael: That’s a very good question, can I experiment? Yes, of course, you can experiment. It’s a client website. Just don’t experiment on like the most popular page that brings the most revenue. Right? if you have lots of more organic traffic and lots of conversions. Don’t work on that page. Pick another one but, there is a whole lot to mention to this and we ran into this really frequently while diagnosing websites that had declines in traffic, declines in organic traffic and trying to figure out what the issue was and you can still face this issue today. So if you experiment too much and you get a bulk increase in bad links on particular pages, you could trigger a signal that says…. And literally, we would see this in a range where the volume of bad links to a particular URL was 55 to 65% of the inbound links. If we found that this majority of links, this point was reached, then it could trigger a manual penalty. Somebody can come along and filter that page and once that’s begun, look out! Right? Because when somebody is manually looking at your web page and they are like in college or grad school and they are making $10 an hour and just said you know what like “Let me check out some of this other pages on this website”, so your experiment, if you do it and you are really overdoing it could bring some really bad attention to other pages on your site and you could trigger like the dOminance are falling, now bunch of my pages are being filtered and you are watching your traffic go down organically. Bill: At the same time, we’ve got to keep in mind that if there are a lot of bad links pointing to one particular page other than your home page, you could actually remove that page on your site where all the links are pointing to. If you remove that page, then actually hopefully, it doesn’t work if it’s your home page but if all the links and all your bad links are pointing to one interior page, you remove that page on the site and make it a 404 error and you can actually be radically also help your site now on the contrary. Michael: And it’s curious Bill like you have a lot of background and domain names, right? You are an expert and that’s very true. The whole thing about ending a penalty, I think triggers or It brings a lot on knowing the real penalty or the source of the penalty, you have to really do a good job of diagnosing because some of the things that I have heard especially with manual filters applied at the domain level, if you trigger that, you can remove all the pages practically, you can sell the domain name and the next owner might have a serious problem out at the gate so I don’t know has it been your experience. Bill: It has been, I mean their links stay with the domain from you know, even if bad links were built to a domain 10 years ago and the domain has changed ownership, those links are still pointing to that domain so you can definitely inherit. So I will definitely do due diligence if I buy a domain. Omi: Because we are talking about it and I’ve got this question directly for Bill. Let’s clarify. Is it true that all algorithms work on a page level and not just the new Penguin? Do you understand my question? Michael: Zara, do you want to take that one? Omi: This question is directly for Bill but you can answer it Michael. Michael: I would say that what we know about Penguin especially is that it works not necessarily even at the page level which is something that’s Zara was talking about and it’s true because the link only points to one page at a time. Right? Michael: But it works at the link level. Its individual links look at the quality of the link, the source of the link, the way it’s engineered and it says “Good or Bad link” “Pass Value or Not”. Boom, done. So it’s even more granular at the page level in a sense. Now the question gets back to other algorithms and updates and are they applied at their domain level, at the page level. Probably the majority of them are applied at the page level and it’s only in my experience when you get to a manual penalty that it starts to become really domain wide and that’s somebody’s judgment that you have been so nefarious in your practices that you do not deserve to be showing and (you know) the top ranks for literally anything. But I mean it starts to look like domain problems like you get a Panda thing going and your content is all thin and shallow and you’ve scraped other sites or something and then it looks like every single page is sliding and then you are going down and it may not happen overnight. It may take time as Google revisits your site, it gets deeper and deeper and you see this long, slow and very sad six-month decline in you overall organic traffic But that’s another thing so it looks domain wide. You have analytics, right? So you have to look and you have to look at the individual page level and see what is sliding as part of your diagnostic. Zara: Now, I think that’s a really important point is for people, not everyone is an SEO. I am not one, you know what I mean. But it is really important to pay attention to what’s happening with your site and use Google analytics and the Search Console to really get an understanding of what’s going on with your site because all that information helps you tune what you are doing on your site. And I think the really important thing for people who create content is being able to take a look at the Google analytics if you are writing regularly for a particular business or something. To look at the Google Analytics, because there are also things that hurt like broken links and those can come from an array of things that happened and if you’ve been writing for a site for a while, you can discover that people that are quoted or articles that they refers to are not on the page anymore or they are just a number of ways that links could get broken and Google doesn’t like that either, so if you have a number of broken links, it really pays to go back and there are many reasons to go back and review your content on a regular basis but links are one of them because if over time you accumulate a number of broken links, Google is going to find out . Michael: Yeah, you’ve hit on something really good there Zara. Even as a writer knowing that there are inbound links and outbound links that could be really useful. You are linking to something really higher authority. Outbound links have been proven to actually contribute to higher rank for pages. So when you are writing an article about some kind or form of commerce and you link to the FTC (Federal Trade Commission) or something, awesome. What could be more authoritative than that? So that’s one thing, you don’t want those links to break on your own site but the inbound links, I like the name we used to call it “link rot”. So over time, the links will just decay and sites go down, or get removed or Bill you’ll sell your domain cause the domain name is more valuable than you are making from the site itself or something. There are all kinds of things that happened, so you are getting at link monitoring. Zara: It is link monitoring. I mean I’ll give you a really good example; this week, I was checking some links and Eric Enge of all people you know from two years ago there were links to various articles that Eric had written lately. One of them was totally gone. He decides for whatever reason had removed that article so broken link. Omi: Did you tell him? Zara: So it really pays to monitor that especially as content accumulates. But, the most valuable links, right! If you find out what they are and it’s a couple of hundred, three hundred links or something. Yes, get on it! Because if you’ve got high domain authority links pointed to your blog, to your posts, to a particular items in your ECOM, do it!! Those are definitely the ones you want to invest some time in. Zara: I want to explain to people that I am not what people think of as an SEO or I don’t mess with other people’s websites, Ok? But the reason I got involved in thinking about SEO was that I really believe it’s important for people who write content for other people to know this things and be aware of them. Omi: Thank you very much, Zara. Zara: These people are your clients, you don’t want to mess up their websites because you are writing a soft copy and it’s really important to have this overview of what’s going on behind the scenes with your content which gives the writer, it’s really an obligation to your client to be aware of these things and if you are including links and all those things in your content, then you are doing it knowledgeably. Omi: Yes, I’ve just received an email. Another question but this one is directed to Michael. I have disavowed about 10% of my backlinks but the penalty is still in place. What did I do wrong? Michael: So we would expect that you would have done a great disavow and there are hosts already that are easy to find and like the three mistakes that you can make with your disavow file and maybe even Bill Hartzer might have written something like that. So it’s easy to diagnose pretty much what your issues might be. Did you write the file correctly? Most of the time it’s useful to disavow entire domains rather than individual links. I mean you might struggle with things, if you are doing it as an agency, you clear up somebody’s Penguin issues. You might be forced by that client to work on individual links and yes, you can build those into your disavow files that you sent to Google. But your quickest action is going to be put entire lousy domains or sources of bad links into the disavow file and on mass, 60/600 bad links from that particular domain will no longer count against you in Google’s mind. So go ahead and do that!! If you haven’t seen any positive result by now. We are into November now. If you haven’t seen a positive result consider that it’s really not a Penguin issue. That it’s not necessarily a link issue. So there is a lots of other sources of manual filters and if you’ve been suffering for two years, you could have started two years ago with assuming that it was Penguin and now maybe there were something else going on. So was it a Panda issue? Was it part of some kind of a local kind of thing, there is a million different ways that Google is going to try and get everybody a total line. Build a quality website and only show good stuff and not try to spam the index. So in that case, you would want to have an expert, maybe Bill Hartzer, you know. Reach out a little bit and go beyond. The greatest thing I think is probably would bury this out. The SEO community is a bunch of people united by the idea that organic traffic is very important and Google can be a friend, can deliver a lot of traffic. It’s not the only source but SEOs help each other out because nobody knows the algorithm. Nobody knows all the 200 other factors. Nobody knows that. So only when we talk to each other, that we help each other and I think a lot of SEOs really get that. All of us are smarter than anyone of us. Reach out to other SEOs. Bill: So make sure that we have disavow and so forth. But there is two factors order for a link, you can disavow a link. But in order for that to be counted, Google has to crawl that link again. So those 10% that he mentioned considering it could be that Google does not crawl those links again or they may not be allowed to crawl. So the site actually, the links could be there and Google could not be allowed to crawl because of the Robots.txt on the site that’s actually linking to you. They are not able to crawl so they can’t see weather the link is there or not. Bill: Disavow is good but when it comes to a manual penalty, if it is a manual penalty, the person asking the question didn’t say whether it’s a manual penalty or not or it’s just a Penguin penalty, but the next step actually is disavow. Just go out and get the links removed completely and either manually do it, link up to who is the owner of the domain name and reach out to the site real owner. Just harass him by email until they tell you to go away or till they will remove the link or tell you that it’s going to cost $50 for you to get the link removed or just use remove or www.rmoov.com which I use a lot to get those links removed. So it’s not just disavow it, you have to get them removed. Michael: So Google says – the reason why I am raising one of my fingers is not because I want to interrupt you – but that you said that very important thing which was part of the good link detoxification and was part of the good Penguin recovery was obeying Google’s wish and their desire that you first try to get the bad links removed. So why? They don’t have to ever crawl that lousy link again. I mean that’s nice and tidy for them. So do it first but so many SEOs and so many web managers said “Why will I waste my time emailing somebody 3 times trying to get a link taken down only to have him turn around and tell me I’ll take that link down for $50. Now I have to pay to have a link removed? I mean common, you built it for free, now I am over a barrel and you are going to charge me?” That was pretty bad but that happened a lot. So people said “well, I’m just not going to bother with that, I’ve discovered through experimentation that I can just build my disavow file, skip that first step which was to have the link removed and still getting effect from Google. Well, Bill comes back to the point. There is a good reason why you kill the links if you can, there is a lot of outreach programs that will let you send the series of emails, each one more pleading and desperate than the last “please remove that link, you are killing me” and then finally to put it in disavow. And just to take this one step further, John Muller noted by www.seroundtable.com I believe it was, talked about the disavow file and when it’s ok to remove domains from your disavow file. So people who are more tidy than I am, people who are good plant Waterers and their plants don’t all die like mine do (Lols). People who will be ready to go back and clean up that disavow file and take things out that they don’t need any more. So the question was “When can I take those links out of my disavow file? And so John Muller says “If you cleaned up the links and they have been reprocessed (in other words re-crawled) and they don’t exist anymore, they simply aren’t there then you can remove those URL’s from the disavow file, not until”. So came back again and kind of emphasized that “if those links are still live, unnatural passing PageRank – he said PageRank – and you can’t remove them, keep them in the disavow file”. Well, so I might look at this whole situation because I’m basically lazy and say “why the heck would I go and take anything out of a disavow file?” Live it in there forever and just add things to it when necessary. Don’t obsess over it. It’s kind a little nuts. Omi: Thanks, Michael, this so insightful. So to go to the next question (oh my God, the time is flying). What is a low quality link? Because we are talking a lot about links. What is really a low quality link? And the question somewhere here was that the guy was saying “I was writing an article about my local community and all the local websites started linking to me but they are all small websites. Are they bad links or good links? Bill: I think it really comes down to the intent of the link. Yes, it’s a small web blogger who makes a link to you and it’s a local community website, they may not have too many links. It’s not necessarily a bad link, it’s more as somebody who cleans up links all the time and sees them. When I evaluate them, I am looking more for stuff that is really obvious that it’s web spam. That is link exchange networks, a one way links.com where you pay ex amount of dollars and they put your link to one network and all these other networks link to you. It’s the article directories, it’s more of the traditional web spam. In a lot of cases, it is hard to spot but typically if you did the link or you paid for the link or you gave blog comment spam with exact marked anchor text. It’s difficult to look at and explain without actually saying “Ok, this is a good link or bad link” you probably would know it if you see it. Michael: The list goes on and on, it has to do with the domain. So like Bill was saying, you see those lousy, lousy domain names are like linkfree.com or something like that, you will know as soon as you see them, you are like “I am killing all those links”. So the link sources are lousy, you know, those things are still out there. The directories where you would go and my company name starts with a “B” so, I go to the “B” part of this directory and I create a link to myself. Nobody goes to those sites, nobody uses those links, it’s a ghost town. Why would you even do that? So anything that’s like free for all directory, directory USA, whatever. That’s not going to help you. A lot of links are built through personal profiles and so even authors such as Zara, not Zara but such as Zara could be building out, you know there is a lot of websites where you can build out an author profile and you would build the link to yourself to your own website or to a client’s website or something and or dozens of clients websites and so profile links became devalued. It was just like another source of spam. Now the better domains of course, still has value but there is a lot of junk out there. Links as Bill said “exact match anchor text” – bad placement of links. That web template “by so and so” link occurred on like 60,000 web pages across the web and part of the initial Penguin strike and they got it removed was to say this can’t be relevant not only that but it killed the template makers traffic completely. So that was something that had to be taken back sort of by Google. So you know there is all kinds of different ways if you have a bolt on set of links, you started a contract, the contract to build you 5000 links on the 29th of every month. Google sees this and goes “Something is going on”. So whether it’s actually Penguin or a manual thing, that’s a big wide open signal and that brings up negative SEO and that’s another topic for another day but there are lots and lots of signals, lots of SEOs who have gone through this in the past who know what a lot of this signals are, look around, find out what they are? Find a veteran who has been through it and we can probably help. Omi: Another question for Bill. Bill, can you hear me? How to run a Penguin audit? What is your favorite tool? And this same question goes to Michael, Zara if you are using any tools. Bill: So what I like to do is to make sure that you just find all of the links. And just the nature of the web now and crawling is that to use Microsoft Excel and just use all of the tools available from explorer to SEMrush, from Majestic, from your own Google Search Console links essentially Ahrefs and combine them into one spreadsheet and then remove the duplicate and so forth. Yeah, you can crawl them yourself. You can use Screaming Frog or something like that and crawl to see which of those pages still exist and so forth. But there are tools you can then take all those links and aggregate them into link research tools using LinkDetox.com you can literally just once you have that list in Microsoft Excel just go through the list. A lot of cases you can just look at the URL and say okay you know this is a good domain. I was going through a list this morning a local business and anything that says yahoo.com I know it’s their local business listing on yahoo so it’s probably okay I don’t even need to look at the link. Other ones that says /link.html or any URL that says /resource2.html, some of these that you can typically spot the link by just working through the URL’s, which ones that are good and bad. But again there are some so it’s kind of a combination of getting all the links from all sort of different sources and then put them into one place where you can deal with them and start working to that. Michael: Yea, manually filtering. That was a great list of tools definitely though I think it’s pretty much better than all the ones I’ve ever used. It kind of brings up another factor which is resolving link problems is one thing but link building seeking great link sources you might be looking at the same tools and there is this important thing that somebody brought to me – I am not the genius here – somebody said this to me at a show. Did you know let’s say Ahrefs has 10.6 trillion links in their database – it’s amazing – and the crawl them over and over which is like a mass of amount of crawling. But a lot of those links in their database that you are looking at may be for purposes of building links are already disavowed like other people and you have no way of knowing. So these links may have no value, you have to be able to evaluate this yourself before you go out reaching and trying to get links built. So a lot of like what Bill is saying ability to quickly manually – to use his word – visually filter that and figure out what’s a good link source or consider it this way. You’ve got Majestic, you’ve got Ahrefs may be they are out there getting every single link on the web and throwing it into database disavowed or not. Or you’ve got somebody like an SEMrush who deliberately pulls the link sources only from what’s ranking well in Google. Now I’ve got a link source that data base that has value. Right now am not pushing SEMrush. Moz has its own link sources kind of does some of the same things? Deduped, cleaned up and all. Omi: You used to work for the right? Michael: You know that’s the other side of all these. And I think that’s a good may be take away for people Don’t be afraid of the Penguin if you have a sense for what is useful for people and makes a good link and it’s likely to bring you useful eye balls, useful traffic, good visitors. Do it and don’t be afraid and you know you brought up local don’t be afraid because Pigeon update made those local links that you brought up even more important than they ever were. Now in the past people chased N.A.P(name, address, phone) they try to clean up all your citations all across the web. Why? So that you would rank better locally. Which turns out that those local links are more important than ever before and just because they are local and they are from a small website is not at all anything about quality. I mean you know just it’s probably the bulk link building, the engineered link ,the link schemes, all those things that SEOs do at scale are probably the worst. Michael: Yeah replicating the links is going to dilute the link equity in the sense if you think of it the old way of link juice – however, you want to think of it – that page has a certain amount of authority or PageRank to deliver. The more links from that page to wherever else on the web, each page is going to get a fraction now of what could be delivered. That’s an oversimplified way of looking at it. What it won’t hurt is: it won’t hurt relevance. So if it’s relevant and you and it’s going to deliver good traffic and some of that traffic converts, yeah!! You go after it. Omi: It must be relevant because they are competitors, right? Michael: Yea, I mean right you hope that it’s relevant. So it’s not something that’s going to hurt but it’s not something that I would put at the top of my priority list. The great thing is to find/side step the competition and find the other link sources because if you are not finding the other stuff then you’ll probably not have tried you know. I mean there is so much stuff out there. Bill: You know, what I would like to do, I do like to look at competitive links and see what links the competitor has. I mean as definitely because there are some good places where you know competitors would have links and you could get them. You are not going to get all of the links you know that your competitor has so there will be a few but I actually like to do is I like to crawl my competitor’s site and get a list of the links that they are linking out to. Then get a link from where they are linking to because then your competitor links to another site and they are passing it over to you. So essentially your competitor is then linking to you. Omi: Reverse engineering. I love it, honestly, I love it. Bill, there is a question directly for you. What is the correct way to outreach really? Because you know there are a lot of small website. They may have great content but people don’t normally link to them so they have to go and do an outreach. So what do you think is the correct way to ask for a link? Bill: Basically a question really what I like to say in the way I can do It is the more personalized message you can to contact that person. You need to prove to that other website that you actually looked at their website. There are ways to write a generic email and ask a 100 website for their links but when it comes to the quality ones it is making a relationship and actually working and viewing their website. If it’s a blog then you are looking at a blog post, mentioning a blog post in particular, asking them a question. It’s more about the relationship and personalizing that message rather just sending out an 100 or even a 1000 outreach emails. It’s about building that relationship and if you keep that in mind when you are doing your outreach then that’s going to be long term. I have had cases where one of my blogs I ran ahead and made some comments and started to build a relationship with another blogger and was able to – it turned into a little conversation couple emails later- and you know I offered to write a blog for his blog and he wrote an article for my blog. Outreach needs to happen with when it comes in the sense of relationships and not just by email but by connecting with people on Twitter, on Facebook, LinkedIn. Any other way to do that connection. So the old style like sending out a 1000 emails you know to the food bloggers to get them to write about your new restaurant is not as effective as saying you are actually inviting a food blogger in your city to come actually into your restaurant and write about it. Omi: Okay guys we are running out of time but I really want to cover two questions very quickly. What about Social Media links? Can’t they be toxic? Michael: So if I can take the first part of that, I have a friend who jumps down my throat every time I talk about social media because he swears that it has no direct value for purposes of SEO. That those links from the social networks are all “nofollow links” and therefore they don’t really drive PageRank. And in that greatest sense of direct he is right. It’s not of direct value. But they have all those indirect values that has to do with bringing traffics, the traffics sticking around, building trust people come back and revisit your site. They go back to Google later. They look up your domain on Google and you get a navigational search on your brand name and people end up on your site and you get a good UX signals going back to Google. There is a lot of great stuff. Could links from social be toxic on the other side of that? Directly again, no. Probably not. But. Omi: But, what if they are not relevant? I mean the question was going into this way. Can people be picked up by Penguin or not? Michael: You know social links being “nofollowed” are very unlikely to even be considered by Google and you know I have to go & I just have to say don’t sweat it. You probably or more likely to have reputation issues you know people saying bad things about you on social whatever then you’re to have issues with social links. Bill: So I have actually, regards to the ‘nofollow, I have had seen one page ranked number 1 in Google for a really very competitive phrase and it only has links from Twitter. It has 16,000 retweets but there are “no follow”. But the same time it is ranking and it only has Tweeter ‘nofollow’ links to it. So I think there are times when Google ignores ‘nofollow; and there are times when they are very specific with it. So it just depends. Michael: You have to say may be it’s a “quality deserves freshness” kind of thing. And everybody expects Social Traffic to be very spiky and quick on set and having to do with emerging trends and things like that and so sometimes they comes on strong and Google is very interested in delivering fresh news, sport, scores and prices and things like that you know these kind of stuffs. Even though they’ll swear they are not paying attention of the social signals and it doesn’t affect ranking. It’s going to because who could ignore the 250,000 visit to something who can afford to do that? Google can’t afford to do that so, yes definitely part of it. I did see it, that same test that you are talking about so, talking about links, talking about social links, talking about making sure that Google actually crawls something. I saw the experiment where a guy just tweeted about it. Built a new page and tweeted about it and sure enough didn’t get a crawl out of Google’s show up on that page. No other way, no links internally from the site – just that tweet. So, you know Google is paying some attention there just question about much I guess. Omi: And this is going to be really my last question. Question coming from William Rock. We all know William rock. How do you think the new algorithm will affect companies in a long term? Is it going to affect companies in any way? Michael: Why don’t we take this one in turns, don’t you want to start? Omi: Yea, this is going to be my last question you know. Do you think that people are going to change their habits of building links? Do you think anything gonna change or they are just going to ignore it again? Bill: No I think it’s positive. I think it gives us a lot more of tools to be able to actually be a more thorough yea you know what we do have links. Yea we can clean them up quickly and efficiently, you know there have been lots of frustration. I have had clients who kept really virtually given up after been penalized for two or three years and closed their businesses just because of Google Penguin. Now you know I think it does have a big impact and I think that finally getting to the point where we have real-time Penguin and in the core algorithm like they have, and I think we have a good point now. Michael: Yeah, absolutely. I think that like so many things, having been through the experience of the first on slot of Penguin I would have to say that you know there is a reason why Penguin was invented by Google The fact that it has become part of the core algorithm makes faster action for people and so SEOs can experiment more and can correct issues you know using disavow so it becomes much more fluent. Thinking about that says to me, people like Page One Power and people who build their businesses on building links in the best possible way. Things could take off for them because I think a lot of the risk has gone out of it. Companies themselves, webmasters themselves , may be somebody runs her own e-come or something like that. You not waiting two years any more you know it’s going to happen all of the time. In the back of my mind, I’m saying two things. There are people out there very eager to get ahead and make lots of money and build tons of links and so some of the old practices may come back, some new ones may be invented, there’s a lot of automation that can be done now. There’s lot of, I don’t want to say artificial intelligence but machine learning that can be applied in this. Like you know there’s this idea of injected attacks that are happening in WordPress and other places, so there’s a lot of nefarious practices still. So one is I know people are going to try to abuse links because there are SEOs who always will and on the other side I’ll have to say that Google is going to continue even though Penguin is part of it. Yea may be Penguin has a little brother you know that comes along somewhere down the line. Omi: Zara, any final thoughts? I like the idea about the little brother. Zara: I like the little brother too. It’s just best practices is best practices you know? And the more that people use them the better those sites is going to be. And it pays to educate yourself and I would say this is especially too for small businesses. If you educate yourself about best practices you won’t be playing catch up later and asking guys like Bill and Michael to come in and rescue you. The better your practices the more your website is going to sound. Omi, thank you for inviting me here that’s the other thing. Omi: You are welcome. On that positive note. Michael: Thanks, Omi. It was great. Omi: Thanks for answering all these questions. In all honesty looking at the list we did not even answer 10% of all the questions my follower sent me on LinkedIn but as I said in the beginning, guys if you have any question do email me, do email Bill or Michael or Zara even. And on that note, if you are a link spammer probably nervous now and for those of us who followed all the Google recommendations, have a great weekend. Bye. Michael: I would just say Omi just one more thing. I mean this is a great content so you’ve got 50 questions. Share them with Bill, share them with myself. If there’s a post that can come out of this if you’ve got a home for it. Omi: Definitely, there you go guys. And you gonna have an article soon. Bye! Michael Stricker / Omi Sido What are the benefits from Penguin 4.0 – the new algorithm being part of the core algorithm and real-time? You really should give it a listen, there are some nuances and a list of tools brought up by +Bill Hartzer. Listen while commuting! 1) Penguin 4.0 HAS already had the effect of recovering rank for many pages that disavowed “bad links”. 3) Googlers specified the effect of links, would be limited to “devaluation”, either boosting “PageRank” or not. Either the link helps, or does not, but there would be no punitive effect FROM PENGUIN. This does not mean that manual penalties and filters may not be imposed. 4) Incorporation of Penguin into the ‘core algorithm’ enables it to act to devalue links with each routine crawl of target and source. No more 2-year waits for an “update” to run. This may be called “real-time”, though it is not, strictly speaking. 5) For several years, marketing discussions and budgets have been more and more focused on Content Marketing, and that is only ONE of the TWO top ranking factors, according to Googler Andrey Lippatsev. Now, links will regain attention.